As I was taking the picture of this card I realized that I had bought the papers to match this stamp set. Oh well, it's going to be summer for awhile so I'll be able to make some more summer cards. Speaking of Summer--Happy First Day Of! Supplies: White Card Blank 5" X 61/2" Halcraft, Papers: Stampin Up-Dusty Durango, Tempting Turquoise, Crushed Curry, Green Galore, Whisper White, Stamps: Stampin Up-Tropical Party, Eat Cake, Ink: Ranger Archival Ink-Sepia, Stampin Up-Kwi Kiss, Crushed Curry, Dusty Durango, Stampin Up-Big Shot Texture plate-Textured Impressions, Cuttlebug embossing folder-Tiny Mosaic, Fiskars Shape Cutting template-Ovals-1, Tim Holtz Distressing Tool, tiny turquoise brad unknown, glue dots. WOW! GREAT color combo on this card! Love the embossing, too! This is so beautifully done!! I love the wayy ou cut out the palm fronds, it adds so much wonderful dimension and texture. Love that pretty texture and that drink looks yummy. Thanks for joining along with Speedy's Friends this week. Love the distressed embossing - it looks wonderful! Thanks for playing with Speedy's Friends! 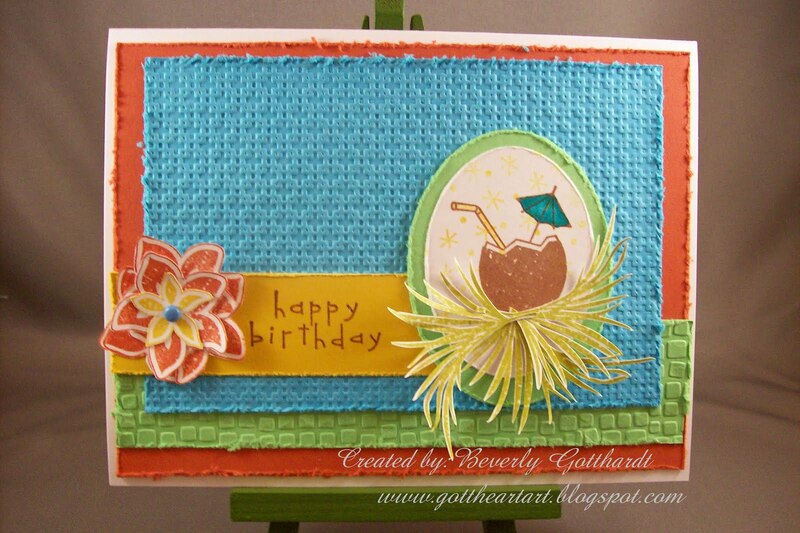 Gorgeous birthday card, love the bright colours you've used. Very summery, Beverley. Thanks for joining us over at Donna's Den of Crafts and good luck with the challenge. 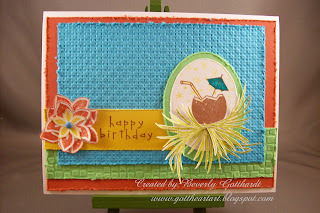 Great card those colours scream summer. Thanks for joining us at Donna's Den & good luck. Awesome card, colors, and embossing! Thanks for joining us at Speedy's Friends. WOW!! I absolutely LOVE this card--everything about it!! Great job!! Thanks for playing along with the Divas!! aloha! Thanks for joining Speedy Cat's Friends! What a great card Beverly! All those cut out leaves just remind me of a grass skirt- so tropical and fun. Perfect! Thanks for playing with the Diva's again- love your take on the sketch! !